Data is now accessed via physical and virtual desktops, laptops and mobile devices. Though supporting such flexibility often proves beneficial for worker productivity, IT organizations struggle to control and manage the widening pool of devices and operating systems. 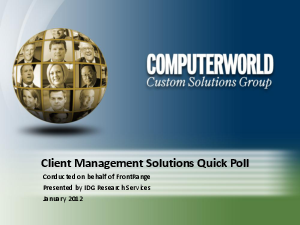 View the Computerworld Survey results to better understand these challenges and prepare your organization.